Next up in our “Ask Drone Girl” series is about using a drone for wildlife population estimates. If you have a question for Drone Girl, contact her here. I am trying to do population estimates in the Texas Hill Country. I am mainly looking at white-tailed deer but would also like to look at smaller, horned lizards, which are a species of concern to our Texas Parks and Wildlife. Could you give me an idea of a drone that will do autonomous flights and record infrared images? What an excellent use of a drone! Coupling a drone with an infrared camera has been a useful trend in wildlife industries, not just for doing population estimates but also cases like spotting poachers and hog hunting, which is an effort to stop invasive species. Since I’m no expert in drones for population estimates, I reached out to Jeff Jackson, the senior Wildlife Enforcement Officer with the Nisqually Indian Tribe in western Washington State. He operates an Inspire 1, Version 2.0 with the Zenmuse X3, Zenmuse Z3, and FLIR cameras onboard, and his specific experience with drones is doing pinniped surveys regarding the depredation of salmon in the south Puget Sound. But as far as the lizards? You’re going to run into some trouble not only because of their small size, but also their body temperature. “The lizards — a cold blooded animal whose temperature is going to be close to ambient air temp with low variation — are going to be his hard target,” Jackson said. Jackson personally uses DJI products — no surprise given the company has a massive, 74% market share. DJI has a range of drone lines — the Phantom, the Inspire, the Matrice — all of which could work for wildlife population estimates. You absolutely want to make sure you have a thermal camera. I recommend looking to FLIR, which is the market leader in thermal cameras. FLIR makes a variety of products designed to seamlessly integrate with DJI drones (rather than mounting a third-party thermal camera to the drone and having to view the footage later). “The FLIR camera gives me the ability to determine sizes and heat signatures when a visual count is not discernible for whatever reason,” Jackson said. There is one reason why you may want to pay more for the Matrice lineup of drones, rather than the Inspire line — and that’s the Zenmuse XT2 thermal imaging camera, which was created by DJI in partnership with FLIR Systems. The Zenmuse XT2 improves upon the existing Zenmuse XT camera, which was an Infrared camera designed to be integrated with DJI’s line of drones, by including not just the infrared camera, but a dual sensor to show a traditional 4K video feed in real-time as well. The XT2 can be mounted onto any M200 Series drone as well as the Matrice 600 Pro. The camera is intended to be used for drone operators who need to capture heat signatures invisible to the naked eye. It offers gimbal-stabilized video and, since it is integrated with DJI’s existing features, allows the user to operate under DJI’s existing flight modes like QuickTrack, which centers the camera on the selected area. A new feature called HeatTrack automatically tracks the hottest object in view. The DJI Zenmuse XT2 has a 12-megapixel visual camera and is available in two thermal sensor resolutions of 640 x 512 or 336 x 256, with 9mm, 13mm, 19mm and 25mm lenses. The Zenmuse XT2 is compatible with DJI’s Matric 200 Series and Matrice 600 Pro enterprise drones. If you want something made by another manufacturer that’s not DJI, consider Yuneec, which makes the Typhoon H Plus with Intel RealSense. Besides the 6-rotor design and 360-degree, 3-axis gimbal with retractable landing gear, it includes the CGOET dual thermal RGB camera as one of its camera options. Consider a drone with dual remotes, so one of you can focus on just flying, while another person on your team can act as a camera operator, concentrating on getting the pictures and wildlife counts. Consider getting a zoom camera for your drone. 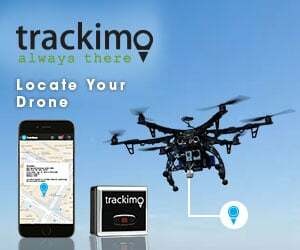 That gives you the ability to zoom in visually for a count while not affecting the animals, who otherwise may be scared of due to the sound from the drone. Jeff Jackson was kind enough to offer up his contact information, if you have more specific questions for him. Also, check out his blog over at BigFokkerDog. Great post Sally, can you mount a thermal camera on any other kind of camera for that matter on a Mavic Air?